Superbowl Sunday is known among quilters to be a unique opportunity for uninterrupted sewing time. Many shops will offer sales on this day. So while I'm waiting to hear Renee Fleming burn all those other silly Anthem singers, I thought it was a good time to update you on my meaningful project work. Wow ok so I've actually followed through with parts of my plan to take my quilting to the next level. 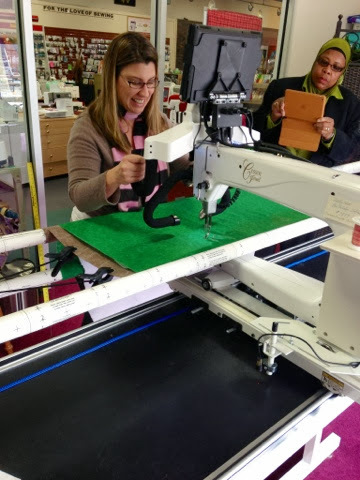 Yesterday, I took a Longarm certification course at Steve's Sewing near me in King of Prussia, PA. It was designed to familiarize you with the use of their machine so that you may rent it for $20/hour. 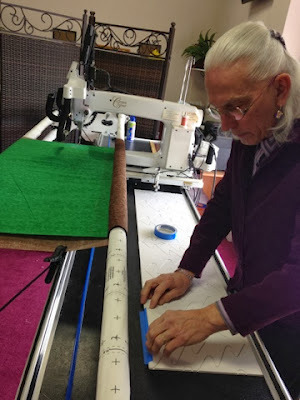 But there was also a student with me who had purchased a Longarm for her home and needed an orientation, and the teacher (Robert) was really adept at tailoring the instruction to our individual needs and skill levels. It really was simple and effortless to control. No more tugging and pulling the quilt through my home machine! This is using "pattern boards" with the stylus on the other side of the machine. Oh yes, I'll be using those! This is our instructor Robert stabilizing the pattern boards for use. 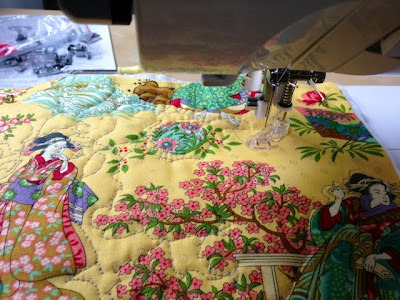 I've also purchased a free-motion quilting foot for my home machine and just started experimenting with it today. 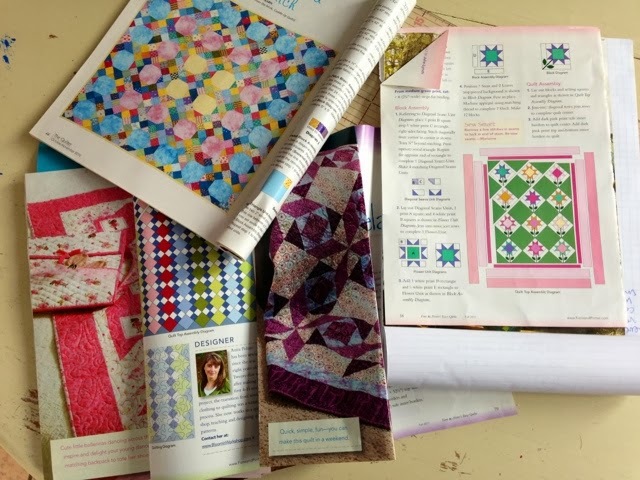 I have signed up for a free-motion quilting course at Steve's in late March, but I'm going to need to hone the skill before then if I'm to quilt the school auction quilts at home by the auction date. I'm excited about either prospect that I've now opened up to myself. I experimented with this generic foot today. 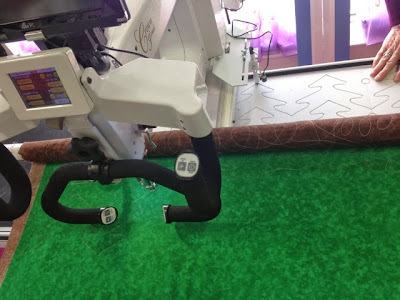 At first I was afraid my machine couldn't do this at all and I was going to have to cancel the class, because I do not have a 'quilter's machine' (I have a Singer.) My husband helped me figure out how it fit on my machine and how to lower the feed dogs so that they didn't interfere with the free motion. (Yay for engineering-types.) 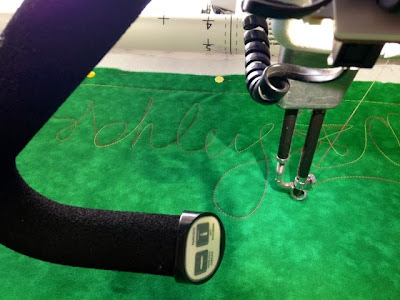 In my Googling to find a tutorial on fitting it to my machine, I actually found a fantastic video by Leah Day on how to make some adjustments to the generic foot to make it run properly on your specific machine. She adds a rubber band, snips the plastic window and bends back the top guide. This is all to reduce the pressure on the quilt itself, and the 'bouncing' of the foot. Brilliant! No, I haven't tried it yet but after a few go's I'm sure I'll be ready for the adjustment. So now I'm inspired to go through my quilting magazines and choose the three patterns I'm going to adapt to my three auction quilts. On another note the collaborator on my musical has contacted me about fleshing out the music in the next month for an internal deadline, so I've got no excuse to keep it waiting any longer! Ok that's what's up over here. I chose to focus on meaningful projects, and they are already making me feel less scattered and more fruitful. other than a big plate of Nachos? Very nice! We have a longarm place like that too. I've threatened to go a bunch of times, but decided I should probably just stick to not knowing what I'm missing. ha!